I read to him Grimms’ TheTwo Brothers. There are two brothers, one rich and one poor. The poor brother captures a golden bird, which the rich brother buys from him, knowing its magical property of granting gold coins. However, it is the poor brother’s twin sons who accidently acquire the gift. Jealous, the rich brother advises the poor brother that his sons are in league with the devil and must be driven out. Abandoned, the youths are taken in by a huntsman, who apprentices them in his trade. Eventually, as huntsmen, they venture into the world. When they are about to shoot a hare, the creature pleads for it life promising them two of its offspring. The two bunnies are so cute, the huntsmen do not have the heart to kill them. The same thing happens with a fox, a wolf, a bear, and a lion. Johannes purrs with satisfaction at the mention of the lion. The brothers part ways, leaving a knife, given to them by the master huntsman, stuck into a tree, knowing that if one side or the other rusts, then that brother is in danger. The story follows one of them and his half of the animal entourage. They come to a kingdom ravaged by a dragon that yearly demands a virgin as sacrifice. The last virgin left is the king’s own daughter. On the hill where the princess is to be given over to the dragon, stands a church. In the church the huntsman finds three goblets of wine, and written instructions on where to find and use the sword to defeat the dragon. When the princess arrives, he secures her in the church. He and his animal companions face and defeat the seven-headed dragon. The huntsman cuts out the tongues and wraps them in the kerchief of the princess. Exhausted by battle, they all fall asleep. A marshal, left behind to observe the proceedings, sneaks up, cuts off the huntsman’s head, terrorizes and carries off the princess, then declares to the king that he defeated the dragon. The resourceful animals restore their master with a magic plant. Knowing nothing of the marshal, the huntsman assumes the princess betrayed him, and it is some time before he learns of the marshal’s treachery. On the day of the wedding between the princess and the marshal, the huntsman returns to make his claim. The marshal has the seven dragon heads, but the huntsman has their tongues and the princess’s kerchief. After the marriage, he is out hunting, when he is waylaid by a witch and turned into stone. His twin brother chances to check the knife and finds one side is rusted. He follows his brother’s path and is mistaken for him when he gets to the kingdom. He keeps the secret, hoping it will help in his search. That evening, retiring to bed with his brother’s wife, he lays his sword between them. The next day he goes hunting and comes across the witch, but is not fooled by her. He forces her to restore his brother. However, the revived brother, upon hearing the other brother spent a night with his wife, without a thought, cuts off his head. Regretting his action, he allows the animals to heal the wounds with the same magical plant used on him. Upon his returning to the castle that evening, his wife asks him why he laid a sword between them the night before. The husband now truly understands the faithfulness of his brother. “Well, what do you think of that?” I ask. Johannes has nodded off. Well, it is a long tale. I lounge in the comfort of Augustus’ testing room, a space replete with properly-made comfy chairs. Augustus’ newest blend is made of two different types of Cavendish, a mixture he calls Gemini. “Something about the two brothers theme?” I suggest. “Exactly. There are multiple sets of brothers: the rich brother and the poor brother, the twin brothers, then the animal sibling pairs of rabbits, foxes, wolves, bears and lions. That’s seven sets of brothers, if you’ll accept my assumption that the animals are all males. The story does not tell us that, but terms like lioness or vixen are not used. Both our pipes have gone out, and the conversation ceases as we re-tamp. Augustus picks up his thread of thought as we settle in again. “This is a story for and about men. ‘Brothers’—especially in its broader sense—is a term that resonates with us. Somehow, the incompatible notions of ‘camaraderie’ and ‘independence’ merge. The two brothers are devoted to each other, and yet part ways to pursue independent lives, leaving the knife stuck in the tree trunk to remain as their unbroken connection. “The sibling animals are something of a masculine comic relief. After the battle with the seven-headed dragon, the huntsman needs to rest, and instructs the lion to stand guard. The lion, having done his part in the battle, also takes a nap, telling the bear to wake him up if something happens. The onus is passed from predator to predator to fall upon the rabbit, who is at the bottom of the food chain. I chuckle, but look at my pipe, which has gone out again. “Then,” pontificates Augustus, “there is the twin thing. Mark Twain identified our twin fascination, and used it in The Prince and the Pauper, as well as in Pudd’nhead Wilson. “Did you look at the Grimms’ notes on TheTwo Brothers?” I ask. That’s what I like about this blend! I think to myself. The mantel clock in my study strikes twelve as I light my second bowl of Gemini. Beside me is a large box of wooden matches, and in my lap is Johannes, a surprising turn of fortune. I must allow myself to feel honored. My mind wanders to the sky as I look out the bay windows, searching for the Gemini constellation, its two primary stars being Castor and Pollux, the twin huntsmen of Greek mythology. 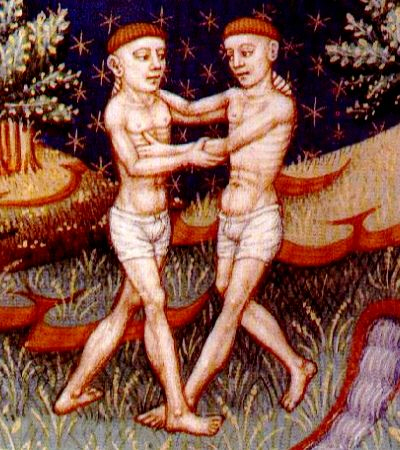 Zeus put them into the constellation when Castor died and Pollux wished to share his own immortality with his mortal twin. Relationships in Greek mythology can get confusing. The ancient sources are not consistent about the births of these twins. Some have them both as mortal born, others as both divine. In the most popular version Castor is the son of Tyndareus, king of Sparta, and Leda, who is seduced by Zeus in the form of a swan, giving birth to Pollux at the same time as her mortal son. I ran across a reference to a runaway version in which the twins are born from eggs along with their twin sisters, Helen of Troy and Clytemnestra. Put that in your pipe and smoke it. Many of the fairy-tale storylines come out of Greek mythology. Cupid and Psyche have been reworked and reformulated any number of times, Beauty and the Beast, and A Sprig of Rosemary, being two examples that jump to my mind. But storytellers have been democratic in their theft. Any mythology is fair game. 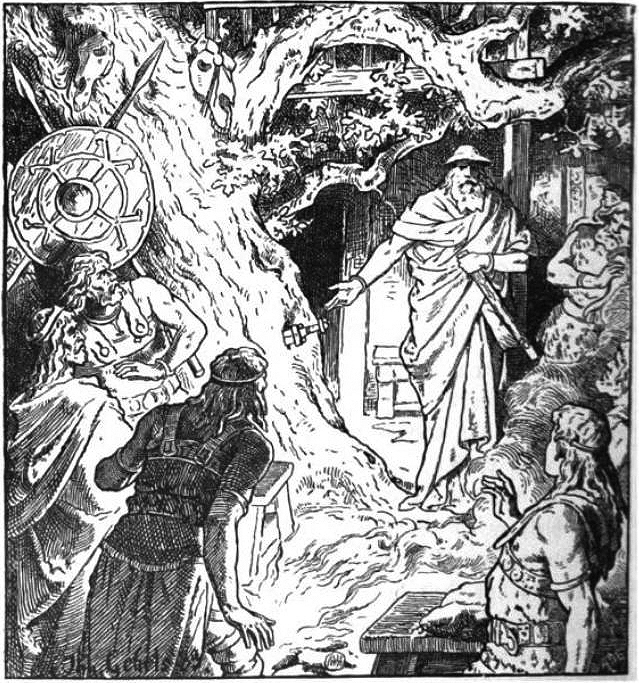 In theVölsunga saga, the hero Sigurðr falls in love with the shieldmaiden Brynhildr, but ends up marrying Gudrun, daughter of the sorceress Grimhild. Grimhild’s son, Gunnar, wishes to marry Brynhild, but cannot penetrate the ring of fire that surrounds her castle. It is Sigurðr, in the form of Gunnar, who accomplishes the task to claim Brynhildr for Gunnar. Sigurðr spends three nights in the castle with Brynhildr, but lays his sword between them. Sigurðr soon returns to his true form, and Brynhildr marries Gunnar. It doesn’t turn out well when Brynhildr finds out the truth. In a love/hate rage, she tells Gunnar that Sigurðr did sleep with her. Gunnar causes Sigurðr’s death and Brynhildr throws herself on the hero’s funeral pyre. Theft is not the only way to cobble together a story. Another method is intrusion, of which Christian thought is expert. The Grimms were Calvinists, and Wilhelm, in his revisions, would quickly replace pagan practices with Christian-themed devices. Angels appeared in later editions of the Grimm stories where mystical wisemen and wisewomen previously had a place. However, in The Two Brothers, I sense the Christian intrusion comes from a more Catholic source. 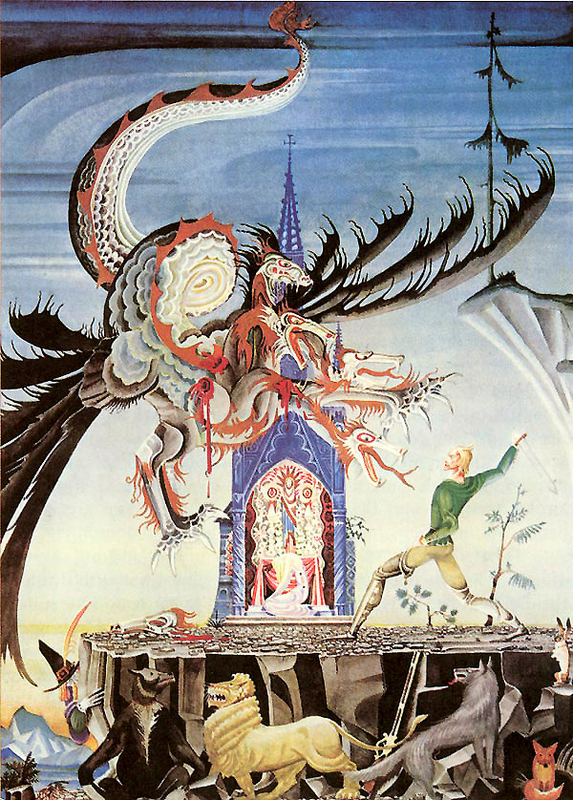 When the huntsman goes to the dragon’s mountain to save the princess, what should be there but a church. I know in my soul, some religious storyteller put that church on the dragon’s mountain. There are three goblets on the altar, presumably filled with wine, and a note that says whoever drinks from the goblets will be the strongest man on earth, able to wield the sword buried under the threshold of the church. Wilhelm, romantic that he was, intruded with divine beings. Here are the accouterments of ceremony. The goblets on the altar suggest the Communion wine, but three of them in connection with a sword? I suspect Catholic trappings are covering a pagan ritual. Frankly, if I were to quaff three goblets of wine, I’d be feeling pretty invincible myself. I am thinking about some wine, but I have this cat in my lap. I would need to disturb Johannes to get a glass. Instead, I will content myself with tamping and relighting my pipe.